Bhiksuni Shiou-I ordained and received Bhiksuni precepts in 1985. From 1985 to 1989, she taught Buddhism at her residential temple while teaching youth at Buddhist Summer Camps. These Camps grew seeds of Buddha's compassion and wisdom in the youths' hearts. In 1989 she joined the Chinese Young Buddhist Association (CYBA). Bhiksuni Shiou-I has been actively involved in CYBA's activities, and social work projects of teaching and counseling in schools and prisons. To guide misguided youth, Bhiksuni Shiou I enriched herself by attending Psychology and Counseling courses, as well as, linking up with experts to develop multi-media teaching aids. These new approaches and techniques helped the youths to recognize themselves, develop their potentiality, and bring about an optimistic, positive outlook on life. Currently, Bhiksuni Shiou-I is writing her fourth book in a series entitled, The Fusion of the Wisdom Oceans Series, which is a collection of 10 books. This progressive book series combines: Buddhist teachings, latest psychological discoveries and counseling techniques, as well as, cognitive applications for daily life. For many years Bhiksuni Shiou-I has been a leader in Buddhism at the international level, attending many international conferences. She master planned and managed the 1st International Buddhist Youth Forum, and co-organized the International Conference for Religious Cooperation and Peace. Her organizational management style is greatly appreciated by conference attendees. At present, Bhiksuni Shiou-I serves as: President of the Chinese Young Buddhist Association and Director of the Young Buddhist Educational Foundation. She is also the Honorary Teacher and Counselor of Taipei Prison, Shi-Lin Prison and Long-Tan Prison. Under her wise and compassionate leadership, CYBA has made enormous progress and achievements. For nine consecutive years, CYBA was awarded the Interior Ministry's Most Excellent in Social Services Special Award. The Ministry of Education has twice presented CYBA with the Great Contribution to Education Award and Executive Yuan of Taiwan's Cabinet exalted CYBA with the Great Contribution to Education Award. In 2003, Bhiksuni Shiou-I received the Eight Virtues Award for Great Personalities and Great Works. 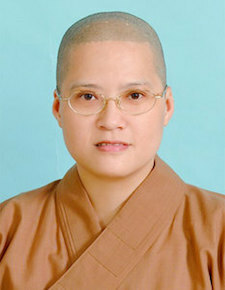 As of 2008, Bhiksuni Shiou-I serves as the President of the Outstanding Women in Buddhism Awards Committee.